A meteor streaks across the sky below the glow of the Milky Way during the 2018 Perseid meteor shower in the Central Idaho Dark Sky Reserve. The Perseid meteor shower dazzles skywatchers every year around mid-August as the Earth passes through the debris left by Comet Swift-Tuttle. This year, I traveled to the recently accredited Central Idaho Dark Sky Reserve to watch the event in some of the country's darkest skies. I departed from New York City and its stormy skies early Saturday morning. Cloud coverage throughout the weekend made skywatching difficult for those in the tristate area. 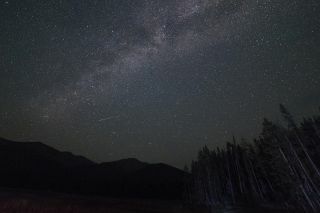 The Central Idaho Dark Sky Reserve encompasses much of the Sawtooth National Recreation Area, as well as several towns just to the south of Sawtooth. I stayed in one of these, Ketchum, a ski town in this southern area located roughly 153 miles (246 kilometers) from Boise. My visit was hosted and arranged by Chevrolet as part of an unpaid media preview highlighting the Chevrolet Bolt EV all-electric vehicle and the 2018 Perseid meteor shower. The Chevy team provided a Bolt EV for my 2-and-a-half-hour drive from Boise to showcase the vehicle's 238-mile (383 km) range. I arrived at our viewing spot in the Sawtooth National Forest at around 10 p.m. Mountain Time. I met the rest of the group members, who had arrived earlier and were already talking with Steve Botti, the mayor of Stanley, Idaho, about the dark sky reserve. With a population of 69, Stanley sits smack in the middle of the reserve. The Milky Way glowed brightly in the clear sky, quite visible despite the headlights and headlamps of the people joining me. Scientists now estimate that nearly 80 percent of people in the U.S. can no longer see the Milky Way, Botti said. "Some of them [have] never seen the Milky Way. They've just read about it in books," he added. "Well, there it is in all its glory." The stars of the Milky Way stretched across the sky above us during a trip to the Central Idaho Dark Sky Reserve during the 2018 Perseid meteor shower. The only lights came from the car and the small citronella candles lit to keep any bugs at bay. During the Perseid shower, this constellation appears in the same location in the sky as Swift-Tuttle's debris trail. As a result, the Perseid meteors appear to radiate away from the constellation, although they may show up far from it in the sky. I was treated that night to a view of several shooting stars, but I looked forward to seeing even more later; the shower would peak the following night. The temperature had dropped to the low 40s Fahrenheit (4 to 7 degrees Celsius) by time we left. It was much chillier than in Ketchum, which was just 24 miles (39 km) down the road. The 1,400-foot (4,000 meters) increase in altitude likely contributed to the temperature change. The car's heated seats provided a welcome reprieve for this underdressed journalist. It was already light by the time I dragged myself out of bed at 7:30 the following morning for a stroll. I had hoped to spot some wildlife in the predawn landscape, but my previous 19-hour day got the best of me, and I only had time for a quick stroll. After breakfast and a jaunt about town, I took a Bolt EV past our skywatching stakeout to a trailhead in the Boulder Mountains. The trail led me along the mountainside through a forest of lodgepole pine and Douglas fir to a small alpine lake. Red yarrow and blue lupines bloomed from the scree along the trail. There were times when all I could hear was my own breath and the buzzing of grasshoppers along the trail. Coming back from the lake, I met a couple who had come to Stanley specifically for the Perseids as well. Originally from Arlington, Virginia, the two had relocated to Colorado and were attracted by the Central Idaho Dark Sky Reserve's accreditation last December by the International Dark-Sky Association. They had previously watched the event from Great Basin National Park, Nevada, which the same association had certified as an international dark sky park in 2016. That night would be the peak of the shower, they told me. Amateur astronomer and dark-sky advocate Stephen Pauley joined us with his wife, Marilyn, at the skywatching site. A retired ear, nose and throat surgeon from Southern California, Pauley studied celestial navigation in order to sail to Hawaii with his family in 1979, using just a sextant and a clear sky for directions. Stephen Pauley points out the features of the northern sky as meteors pass overhead on Aug. 12, 2018, in the Central Idaho Dark Sky Reserve. In the early 1980s, Pauley and his wife built a home in the town of Elkhorn, near Ketchum. But with each passing year, he saw fewer stars in the sky. In the 1990s, Pauley began advocating for ordinances to reduce light pollution, ultimately spearheading the movement that resulted in the dark sky reserve. As I lay on the ground watching for shooting stars, Pauley recounted his three decades of work with city, county and federal agencies. He also explained how artificial light interferes with plants and wildlife, as well as our own circadian rhythm. "Be sure your kids sleep in the dark, you sleep in the dark, and tell all your friends to sleep in the dark," Pauley implored the group. He then began his guided tour of the night sky. He pointed out Arcturus, near the Big Dipper, and hopped from the constellation's bowl to Polaris, the North Star. But just then, a spectacular meteor streaked across the sky, pulling our focus away from our host's tour. Pauley then directed our attention behind us, far from the action of the meteor shower, to the center of the Milky Way, in the constellation Sagittarius. When I asked where I could find Andromeda, our closest galactic neighbor, he pointed me toward a dull white glow in the galaxy's namesake constellation, right next to Perseus. Lifting my binoculars to observe the galaxy in greater detail, I saw countless previously invisible stars, slightly too dim to see undaided, which immediately disoriented me. The number of meteors you see in a night depends on many factors: sky conditions, stream density and size, time, location, and luck. For the Perseids, the debris stream is large enough to give all locations pretty much equal views, according to Mike Hankey of the American Meteor Society. But many meteor showers will hit certain locations harder than others. You can also glimpse more meteors in a dark sky, because you can see the fainter ones that aren't visible to people in bright cities, he said in an email. The shower continued long after I joined the last of the shivering group to leave the site around midnight. Before we departed, Pauley brought out a sky-quality meter. The device measures the sky's background luminance, which corresponds with light pollution. A perfectly unlit night sky gives the maximum readout of 22 on the device, Pauley said. Somewhat counterintuitively, lower numbers indicate brighter conditions. That night, the meter registered 21.24, just shy of perfect. Editor's Note: Harrison Tasoff traveled to the Central Idaho Dark Sky Reserve on an invitation from Chevrolet as part of an unpaid media preview event highlighting the Chevrolet Bolt EV and the 2018 Perseid meteor shower.